A Sardinia sailing itinerary takes you to Italy's stunningly beautiful Maddalena Archipelago National Park and Marine Reserve and the world-famous Emerald Coast, well known for its superb beaches and myriad coves and bays. On longer cruises you can sail northward to the island of Corsica, France, or transit the Strait of Bonifacio and head south down the northwestern side of the island of Sardinia, where it's a little less expensive than on the Emerald Coast and much more laid-back (see Sardinia maps). Both the archipelago and the main islands are enchanting cruising grounds regardless of the length of your Sardinia itinerary. They blend the boutique shopping, fine dining, and lively nightlife of chic ports such as Porto Cervo and Porto Rotondo with the quiet and scenic beauty of the largely uninhabited Maddalena Islands. Most of all the sailing in these waters is splendid, with good winds an almost everyday occurrence. Cannigione to Porto Cervo - 11 nm. Your Sardinia sailing itinerary typically began the previous day, Saturday afternoon at 3:00 P.M., when you arrived at the base in Cannigione to check in, provision the boat if you hadn't elected to have us do it for you, and receive your pre-cruise chart briefing. Now that you've enjoyed a restful night aboard, it's time to head out onto the shimmering Tyrrhenian Sea to your first port of call, the lovely and world-famous Porto Cervo. It's a relatively short passage north out the Gulf of Arzachena into Sardinia Bay, and then southward to one of the prettiest harbors in Italy where you can enjoy a first-class marina, fine dining, and exclusive nightclubs. Mooring: Moorings are available. There is room to anchor in the outer reaches of the harbor. Things to do: Peach, cream, and white stucco buildings with red terracotta-tile roofs occupy the slopes overlooking the harbor of Porto Cervo, giving the village a look distinctly evocative of the Mediterranean. The Piazzetta, or village square, is closed to vehicular traffic and is the hub of the port. Exploring the narrow streets extending from it immerses you in the upscale ambience as you browse in boutiques and jewelry stores featuring the big names in high-end products such as Gucci, Cartier, and Bulgari. The restaurants and cafés in and around the Piazzetta are excellent, and at night live music and dancing is exceedingly popular at the tony nightclubs. Porto Cervo proper has no beaches, but on either side of the harbor are superb white-sand beaches stretching for miles. Anchoring off them for a day stop in settled weather isn't a problem, particularly because you'll be in the lee of the land in the prevailing northwest winds. Porto Cervo is home to the famous Costa Smeralda Yacht Club, which hosts many regattas throughout the sailing season. Porto Cervo to Porto Rotondo - 9 nm. Still continuing south, you will pass numerous beautiful white-sand beaches, many of which are excellent day stops for swimming, snorkeling, and sunbathing. Sardinia's Emerald Coast is charmed with some of the best beaches in Italy. The one at Cala de Volpi resort is a prime example. You will also continue sailing among the smaller islands of the Maddalena marine park - picturesque, uninhabited, and teeming with wildlife. Ashore is a further opportunity to savor the delights of another world-famous harbor known for its designer shops, upscale restaurants, and exclusive nightclubs. Some of Italy's best artists designed the squares, the amphitheater, and the magnificent church, all of which are wonderful to explore on foot. This is also true of Porto Cervo. Mooring: No moorings are available. No anchorage is available in this small harbor. Things to do: The village of Porto Rotondo spreads out around the shores of the cove, picturesque and decidedly upscale. A stroll to the center of the town takes you to the public squares. San Marco Square is constructed of locally quarried granite and was designed by the renowned sculptor Andrea Cascella. The Church of St. Lorenzo, itself an architectural icon, houses more than 2,000 wooden sculptures by Mario Cerioli, who is said to have worked on them for seven years. Live musical performances in the stately granite amphitheater are a delight, if you are lucky enough to attend one. The miles of white-sand beaches are another major attraction of Porto Rotondo, where all kinds of watersports are popular. Rental cars are available for inland excursions to the archaeological sites such as the Li Muri Necropolis and the Tomb of the Giants of Li Loughi. Facilities: Dockage and all other facilities for yachts are available. Advance reservations are essential. Porto Rotondo to Caprera Island - 13 nm. About four nautical miles from Porto Rotondo are the uninhabited islands of Mortorio and Soffi, two of the gems within the protected Maddalena marine preserve. Beautiful white-sand beaches fringe the shores, presenting an ideal setting for swimming and snorkeling in crystal clear water, though landing and overnight anchoring is prohibited. Both islands are a wonderful day stop before sailing northward to Caprera Island deeper into the Maddalena archipelago. The heights of the main islands rise above the deep blue of the sea in reddish hues from the pink granite rocks that make up much of the land in this part of Sardinia. Splashes of green from macchia, juniper, and wild berry bushes clinging to the slopes add a pleasing contrast to the scene. 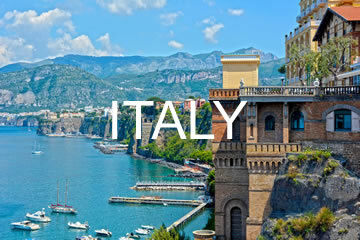 The rugged, cliff-lined coast to port is one of the prettiest in all of Italy. Mooring: No moorings are available. Among the best anchorages are the fjord-like Cala Coticcio and Cala Portese on the southeast side of the island. Dinghy dockage: No dinghy dockage is available, but landing the dinghy is easy in the many coves for exploring ashore. Things to do: A visit to the Garibaldi Museum is a highlight of sailing Caprera. Hiking in the hills and along the many beaches is a delight, and for those interested in a longer walk, trekking the road built on the dam connecting Caprera to Maddalena is a unique experience, like being in the midst of the sea while still on foot. Snorkeling and swimming is superb at Caprera, which is also one of the premier scuba diving sites in Italy. Dive excursions to view the many Roman shipwrecks and natural granite bottom features teeming with red sea fans and sea creatures can easily be arranged. Caprera Island to Maddalena Island - 10 nm. Neighboring Maddalena Island is wild and rugged and mostly uninhabited, but of all the islands within the archipelago it's the only one with a small town at the port of Cala Gavetta, which has services for yachts, including dockage. Small hotels and bungalows dot the land, and vineyards occupy some of the interior. A carriage road leads to the top of diminutive Monte Guardia Vecchia (elevation 511 feet) and makes for a pleasant afternoon stroll rewarded with magnificent views of the mainland and surrounding islands. 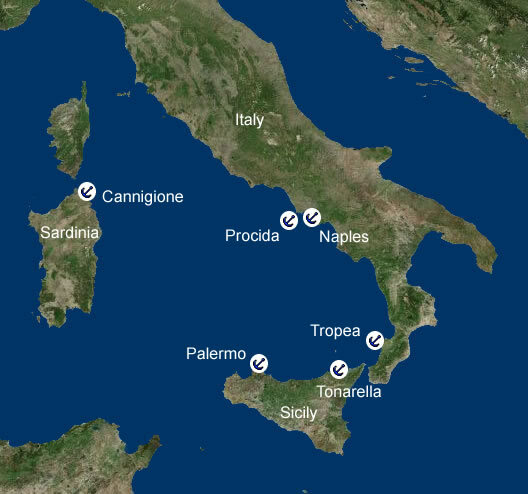 While Caprera Island and Maddalena Island are actually connected via a bridge and are less than one nautical mile apart at that point, the distance from the east side of Caprera Island to the west side of Maddalena Island is about ten nautical miles, where exquisite bays and coves excellent for overnight anchoring abound. Mooring: No moorings are available. The main harbor is Cala Gavetta on the south side of the island. There are many excellent anchorages at Maddalena Island. Cala Francese is a favorite and provides good protection from easterly and northerly winds. Other excellent choices for anchorages include the deep cove of Stagno Torto, Cala Portolungo, and Calla dello Spalmatore. Things to do: As with neighboring Caprera, exploring the many coves and bays is a highlight of sailing Maddalena. The swimming and snorkeling is excellent, as is the scuba diving. Spending time in the small port of Gavetta to stroll the narrow streets and browse through the shops, where you can buy handicrafts, jewelry, and other items made by local artisans, is a laid-back way to pass the time. Enjoying dinner at one of the intimate cafés or restaurants, or sipping a cocktail aboard your yacht in a scenic anchorage is a wonderful way to savor the delights of Maddalena. Facilities: Fuel and water are available at Cala Gavetta. Dockage is also available. Advance reservations are essential. Maddalena Island to Cannigione - 6 nm. The final leg of your Sardinia sailing itinerary takes you from Cala Gavetta on Maddalena Island back to beautiful Cannigione, where you can relax over an excellent meal in town after you arrive at the base by 5:00 P.M. to check out the boat. You'll bask in the sheer delights of the past week on the Tyrrhenian Sea. Mooring: No moorings are available. There are many pretty anchorages near Cannigione. Things to do: Cannigione is about a one-hour drive from Olbia, one of the major communities in northern Sardinia, and it's close to the Emerald Coast and the mountains of Gallura. Along the waterfront you'll find a number of interesting shops and superb restaurants. There's also a pleasant beach within walking distance, where you can take a refreshing swim or simply relax and admire the scenery. Taking your yacht to the end of the gulf brings you to a lagoon-like setting surrounded by lush green fields. A charming village perches on the shore. Renting a car to tour the nearby archaeological sites of Arzachena is an intriguing way to learn more about northern Sardinia and its history.